As of January 1st 2016, Charlie Ponde became the Alberta Real Estate Foundation’s 13th Chair of the Board of Governors. Charlie Ponde was born in India and completed his university education in the city of Mumbai. Charlie immigrated to Canada 48 years ago. After working in the dental field, Charlie entered the real estate profession in 1992, to fulfil a passion for buying and selling real estate and for working with people. Charlie has been an active and full-time member of the REALTORS® Association of Edmonton ever since. Charlie was elected and served as the President of the REALTORS® Association of Edmonton in 2009 and now is a Life Member of the Association. 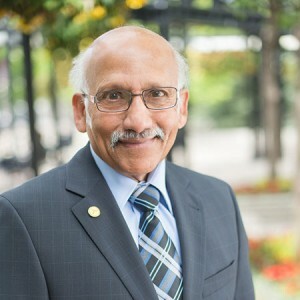 He served on numerous committees relating to real estate including AREX Claims Committee, the Edmonton Realtors’ Charitable Foundation (Governor and President), the Arbitration and Professional Standards Committee, the Technology Committee and the Government and Political Action Committee. An active member of the community, Charlie has been involved with the Affordable Housing Committee, Sign of Hope Campaign – Catholic Social Services, The Christmas Bureau, Realty Watch and the Neighborhood Watch Programs, St. Albert Lottery Board, St. Albert’s City Plan 2000 Advisory Committee (Municipal Development Plan), the Edmonton Immigrant Services Association and is a Director with CARP, a seniors national advocacy organization. The Foundation would like to express their deepest gratitude to Gary Willson who will be stepping into the role as Past-Chair. His leadership and experience in planning, industry and community engagement has enhance the Foundations profile and helped increase its reach throughout the province through collaboration with industry and communities. Charlie will serve a two year term as Chair of the Board. His experience in the industry, insight on community initiatives and remarkable networking skills will bring much value to the Foundation.